SHOCKING condition rarity and eye-appeal! You may say, "Hey, there’s no Cameo grade. It can’t be THAT special. What's there to get so excited about?” However, out of 2,194 1953 brilliant Proofs graded, only 9 have achieved PF 69 RD status, with none graded as a perfect PF 70!! 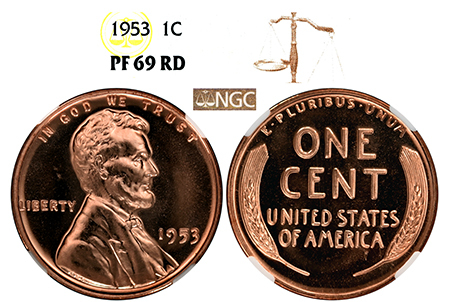 Early date Lincolns rarely achieve the PF 69 RD grade and have very low certification levels until 1954, which still only has 52 examples graded. This is a flawless-to-the-eye, 1953 cent: no spots, no haze, no visible blemishes, and NO awful toning that "Box Era” Lincolns are infamous for! The materials used for packaging reacted with the copper composition of Lincolns, often resulting in the development of toning spots or just black toning. This example is TONE-FREE! A pure, unadulterated 1953 Lincoln- one of the few in existence!